Griddled Lamb Steaks with Creamy Mushroom, Pepper & Courgette Stroganov – Low Carb Dishes Don’t Get Any Better Than This! This was the nicest meal I’ve had in a long time. I can’t therefore praise it enough! There’s something about stroganov that innately speaks ‘comfort-food’. It’s creamy, rich and filling; but has just the right amount of kick due to the heat of paprika. This makes it the perfect thing for a chilly winter’s evening. Lamb is also a firm favourite. If you’re going to pair meat with something like stroganov; the meat needs sufficient flavour to hold its own against the sauce. Beef or lamb is therefore ideal, whereas something like chicken would risk getting lost. The cut I chose was lamb leg-steaks. These are quick to cook and remain tender, despite their relatively short time in the pan. Once you’ve tried this, you’ll understand why I like it. The whole thing is ready in 30-40 minutes, and it doesn’t require ‘standing over’ or mothering whilst it cooks. Beyond all else however, it is supremely delicious. Due to the very low carb-content, this recipe is suitable for diabetics and gluten-intolerants. If you’re on a paleo-diet it is also ideal. In fact, I recommend it to everybody! Start by making your stroganov. Finely slice a large onion and soften this in a sauté-pan with a little butter and oil. Adding oil to the butter stops the latter from burning. Burnt butter is not only careless, it’s also shameful and a wasteful tragedy! There; you’ve been told – don’t let it burn! Roughly chop peppers and courgette and add these to the pan, followed by whole mushrooms. If these are on the large side, simply cut them down the middle. This dish requires chunks however, so not too small. Crush in two cloves of garlic, add a chopped chilli and sprinkle on two teaspoons of paprika. Leave to cook for a minute or so, then deglaze the pan. I like to do this first with a small quantity of vodka, then follow it by a little dry vermouth for sweetness. An inquisitive nose held over the pan will be rewarded with a powerful waft of fragrantly alcoholic steam. A cook must get their perks somehow…! Once the liquid has reduced, pour on a cupful of water and crumble in a chicken stock cube. Simmer for 20 minutes, then swirl in generous glug of cream. Taste the sauce to check for seasoning and adjust if required. Meanwhile place a griddle-pan or thick-bottomed skillet on the hob. Once this is really hot, season your lamb steaks and coat with a small quantity of oil. Then lower these into the pan, enjoying the playful sizzle as they hit the dry metal. Few things can be more mouth-watering than the scent of seared lamb. Be sure to enjoy it for the full six minutes; three minutes on each side to retain an element of the medium rare! Spoon your stroganov onto a heated serving-dish, then lift your lamb out of the skillet and place next to your vegetables. Garnish the finished dish with a a sprinkle of chopped basil or parsley then rush to the table whilst the lamb is still sizzling. There’s only one word for this… Divinely delicious! Okay, so that was two, but one didn’t quite seem to do it justice! However many words you end up using, be sure to give this a go and let me know the results. Low Carb Lunch! 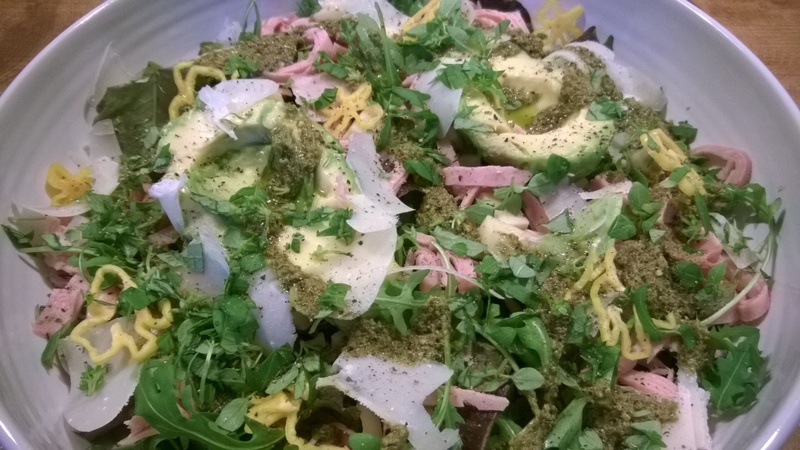 Emmental, Ham & Avocado Salad in a Rich Pesto Dressing. Sublime! Salads are always a perfect luncheon dish, or equally a great starter to a main course. They’re ready in minutes and are packed full of nutrition. They also contribute to your ‘5 a day’; which is always welcome. The key to a good salad is the dressing. Things like vinaigrette or Caesar-dressing are delicious, but they can be time consuming. To remedy this, I thought I’d share with you the world’s easiest ‘quick fix’ recipe – pesto dressing! I use it when I’m pushed for time, or have run out of more complex ingredients for other things. Or equally, just whenever I fancy it – it tastes wonderful! Making this couldn’t be simpler. Put a large dessert-spoonful of jarred pesto into a small mixing-bowl. Slowly stir in olive oil with a spoon until the mixture is sufficiently runny to ‘drizzle’ off the lifted spoon. If it falls in clumps, you need more oil. Hey presto! That’s it. It makes a perfect accompaniment to so many salads, fish, cooked-meats, chicken, cheese… the choice is endless. For this particular dish I’ve chosen smoked ham, Emmental & avocado, which is a delicious combination. Spread your salad leaves in the bottom of a large bowl and sprinkle over a generous helping of finely sliced ham. De-stone your avocado and arrange this is the centre, then shave over a good quantity of parmesan. Avocado always needs something salty, so any hard Italian cheese is the perfect thing to pair it with. To provide a little substance and texture, I’ve also added diced Emmental. Emmental is one of those cheeses with a dense, resistant ‘bite’ and mild nutty taste. It’s great for salads because it’s easy to chop (unlike crumbly or soft cheeses) and it doesn’t war with the other flavours. A salad that tastes of only one thing, must be considered a disappointment in the extreme and reflects a poor choice of ingredients. Strew your diced cheese all around, then spoon over your dressing. To compliment the pesto, scatter over finely chopped basil and season with salt and pepper to finish. I’ve also added sliced scotch-bonnet chillies to give things a kick! But these are entirely a matter of preference, and can be omitted if they’re not your thing! All that remains is to get stuck in! So don’t delay. 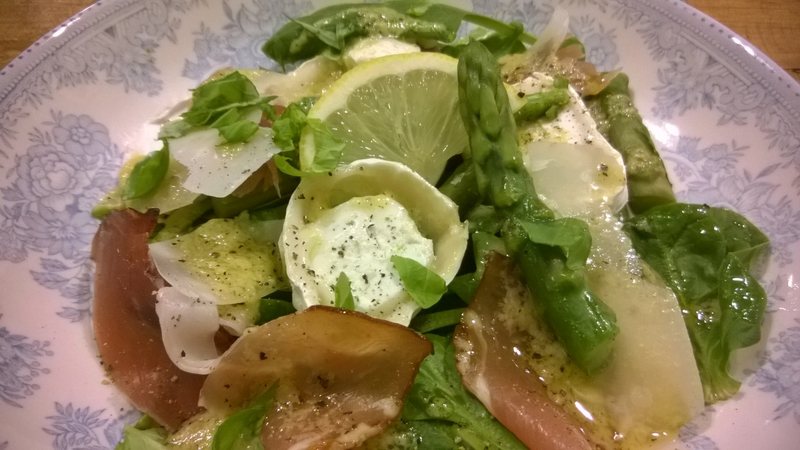 Spinach, Asparagus, Serrano Ham & Goat’s Cheese with Tangy French Vinaigrette – a delicious low carb salad that’s ready in minutes! Asparagus is one of my favourite things. Good job it’s low carb! Here I’ve teamed it with smoky Serrano ham, baby spinach leaves and classic French vinaigrette. This delicious combination is ready in three minutes flat and is incredibly straightforward; more a matter of assembly than anything else! With regards the Serrano ham; this dry-cured ‘mountain ham’ from Spain can equally be replaced with Italian Parma-, or German Black-Forest ham. All are equally delicious, so if you can’t decide on taste, let availability be your guide. Bring a shallow pan of water to the boil and blanche your asparagus for two minutes, until soft but retaining bite. Then plunge the cooked spears into cold water so they keep their vibrant green. Place your spinach into the base of your salad-bowl, then arrange your asparagus on top. Layer on slices of the cured Serrano ham, then position your rondelles of goat’s cheese. You can equally cut the cheese into rustic chunks if you prefer – the choice is all yours! Finely shave a little parmesan over the top, followed by roughly chopped basil leaves. Finally, spoon your vinaigrette at intervals over the salad, then finish with a good grind of pepper. Low carb doesn’t get any easier or faster than this! 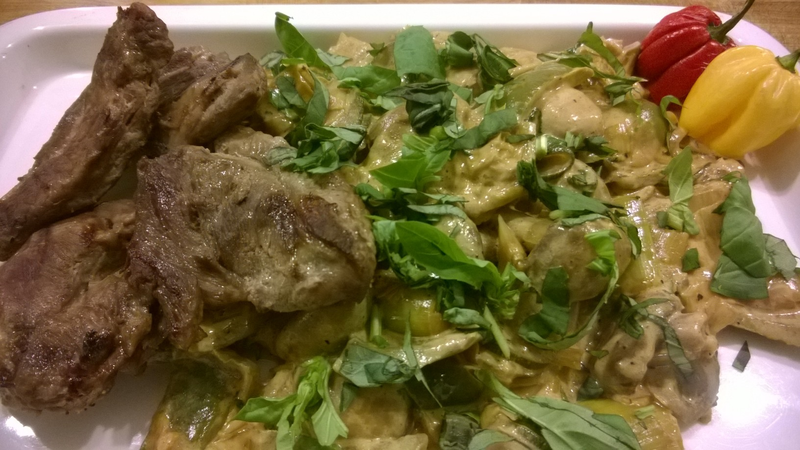 Creamy Goan Lamb Curry with Coconut, Mushrooms & Rainbow Peppers – aromatic, delicious and low in carbs! Goan curry is very much the unsung hero of the spice-world. Its true beauty lies in the fact that it’s aromatic and mildly spiced; completely lacking the often intensive ‘chilli kick’ of its hotter Indian counterparts. The habitual use of coconut milk adds a rich creaminess, which perfectly complements the mellow flavour and adds just the right touch of sweetness. Beyond its exquisite flavour, Goan curry has another string to its ample bow – it’s a true joy to cook and is incredibly simple & straightforward. Don’t get me wrong; I love the intricate grinding, blending and mixing of a good home-made curry, but sometimes you just want something easy. This dish is certainly that; yet tastes anything but! There are no pastes to make, or spices to roast and grind. The whole thing can be made from store-cupboard staples and is powder-based; so a spoon is all you need to measure out the ingredients and create the flavour. This dish works equally well with fish, chicken or vegetables; indeed chicken and fish are the Goan staples. Here however, I’ve chosen to use minced lamb on account of its deep, rich, succulence. The smell which fills the kitchen when you cook with lamb is mouthwatering beyond compare. Add to this the perfumed, exotic scent of ground spices and you’ll want to cook this time and time again! Start with the marinade. Measure the following into a large mixing-bowl: 1 1/2 tablespoons of ground coriander, 1 teaspoon of ground cumin, 1 teaspoon of paprrika, 1/2 a teaspoon of turmeric, 1 teaspoon of chilli powder, a tablespoon of lemon juice, 3 tablespoons of water and a generous pinch of salt. Mix all together, then add your lamb-mince, or whichever meat you choose to use. Amalgamate well and leave to infuse in flavour for at least half an hour. Meanwhile, prepare your vegetables. Finely slice a large onion and crush two cloves of garlic. De-seed half a red pepper, yellow pepper and green pepper, then chop these into bite-size chunks. Roughly slice a couple of handfuls of mushrooms and set all aside in a bowl. Any spare vegetables that need using can also go in. I had some mange-tout which needed a home, so in they went! After half an hour, heat a little oil in a heavy pan on the hob and spoon in your marinated meat. The smell should be divine! Sear and brown the lamb until pleasingly coloured, then add your vegetables and stir through. Leave these to cook for ten minutes until soft, then crank up the heat and add in a can of coconut milk, mixed with an inch of water. Crumble in a chicken stock cube for background depth, then spoon in a dollop of dijon mustard (a good teaspoonful!). Leave to simmer on a low heat until the sauce is thick and glossy, circa 20 minutes. Once done, sprinkle over a generous handful of chopped basil and take to the table. I have a confession to make here. I was going to serve this with some cauliflower-rice that I had pre-cooked in the fridge. Somebody (who will remain nameless) found this however, and polished off the lot for lunch whilst I was at work! I think I’ll need to install a lock on the fridge-door, to save my carefully planned meals from scavenging, peckish diabetics! My backup plan was a quick sauté of courgette-noodles. Equally delicious, if slightly less classical…! Whatever you end up serving this with, I hope you enjoy it as much as we did. 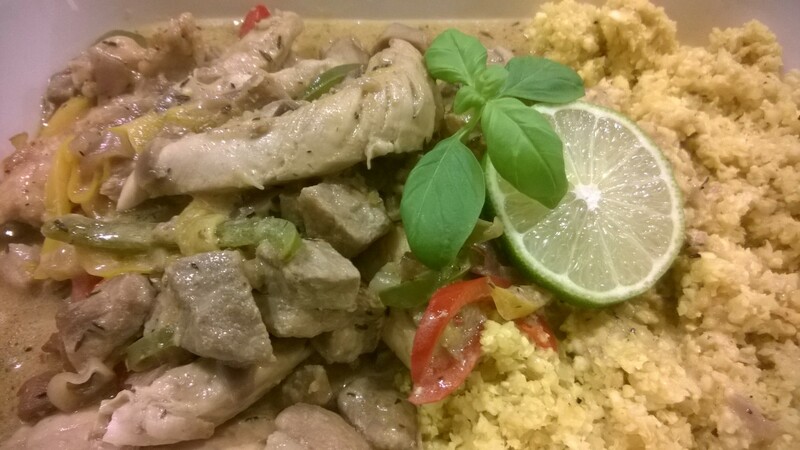 Fiery Jamaican Chicken & Pork with Rum, Coconut & Turmeric Rice – a low carb taste of sunshine! Okay, so I freely admit that both chicken and pork may seem a little excessive; but sometimes life is there to be lived, so why hold back?! This dish in no way requires the two; feel free to use either independently. Let’s just say I was feeling extravagant; but the results are well worth it! There are some flavour-combinations which make you feel glad to be alive; and this is one of them! The sweet creaminess of coconut-milk and rich, warm depth of chicken-stock form the perfect basis for so many recipes – Jamaican, Thai, Indian… the choice is endless. But this particular dish has an added bonus – white rum! There’s no need to worry about the carb-content of rum. This is a low-carb blog, so anything you see here will be suitable for ketogenic-dieters, diabetics and those following a paleo-regime. The net carbs of white rum is between 0 – 0.1g per 100ml, and we’re only using a fraction of that! Be careful not to mistake it for dark rum however. That’s a different kettle of fish entirely. Although not massively high, the sugar-content varies enormously, so I always feel it’s better to be safe than sorry! The rice I use here, is my standard cauliflower-rice recipe; just with half a teaspoon of turmeric added when it goes into the pan. If you don’t know how to make this, take a quick look at the following recipe and all will become clear. It couldn’t be simpler, so don’t be put off by trying something new. You won’t be sorry you did! Start by placing a heavy-based pan onto the hob, and browning your diced chicken & pork in a little butter mixed with oil. Then add sliced onion, chopped garlic, chilli and a sprinkle of dried thyme. Continue to hob-cook until the meat is golden brown and the vegetables soft & tender. Once this has occurred, crank up the heat and deglaze the pan with a healthy glug of white rum. Standing with your nose over the pan at this point is an experience like no other! The rum billows out in a cloud of steam, carrying with it the alcohol-content and acidity. All you’re left with is the sweet flavour of spices, and a comforting, exotic ‘warmth’. Once the spirit has reduced, add a cupful of water and crumble in a chicken stock-cube. Pour on half a can of coconut milk (not low fat!!) and stir in well to incorporate altogether. If you wish, you can also grate in the zest of half an orange, to add perfume; but this is entirely a matter of preference. Simmer this on a low heat whilst you prepare your rice. After ten minutes or so, the sauce should be thick, glossy and smooth. Taste to adjust the seasoning, then squeeze in a good whack of lime juice, followed by chopped basil. Transfer your rice to a pre-warmed serving-dish, then ladle on the meat and sauce in generous quantities. The taste of this dish really is sublime. I can’t recommend it highly enough! Even though it’s cold outside, your kitchen is transformed into that much longed-for place in the sun. A true tonic for the soul, if ever there was one. Just add a low-carb mojito to the mix, and paradise will be yours! 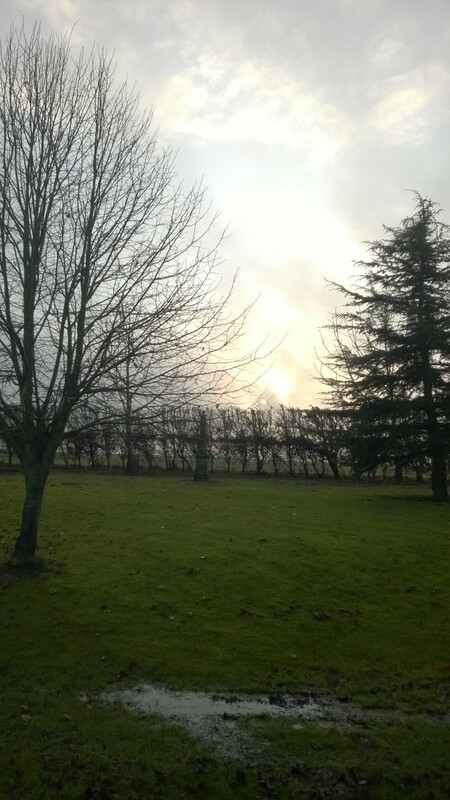 We’ve had a lot of rain over the last few days, but now the sun is trying its level best to shine through. But every cloud has a silver-lining; in this case quite literally! What sheer and unmitigated joy is to be found in launching oneself with verve & vigour into the deep, murky centre of a large muddy puddle! It is for such things that the humble Wellington was born, and we should give unequivocal thanks. Personally speaking, I like to look around around me to make sure no-one’s in the vicinity; then let out a gigantic whoop as I sail through the air and land with a rich and rewarding splat! Your inner-child deserves a treat, so indulge yourself post haste! Whatever you get up to today, make sure to find the time for a little joy. It’s a true tonic to the soul! Succulent Roast Gammon with Braised Autumn Vegetables in Creme Fraiche – with food this good, who needs carbs? Gammon is one of those incredibly warm and comforting foods. A fine crackling crust gives way to unctuously tender meat, that literally melts in the mouth. The curing & smoking process lends it a pleasing saltiness, which is incredibly moreish. And as for taste; its depth and intensity requires little fussing! Any attempt to complicate the flavour will most certainly end in a fight! You’ll end up with an over-powering muddle of flavours which is as muddy as it is disappointing. Gammon is a thing best prepared as simply as possible. And that’s equally to cook’s advantage – maximum reward for minimum effort! Here the vegetables are cooked alongside the meat. This allows the flavours to slowly infuse together, making the resultant sauce a true triumph of taste and texture. A final swirl of creme-fraiche puts the cherry on the cake in terms of luxury; adding a velvety smoothness which is beyond compare. If you don’t take my word for it, give it a go yourself. You won’t regret the effort. Just be sure to tell me how you got on…! Due to the salt content of gammon, it’s best to season mainly with pepper and dried herbs alone. Seal the meat on all sides in a little butter and oil, then place into the oven for 20 minutes whilst you prepare your vegetables. Roughly dice whatever veg you have to hand. I chose a proud autumn selection – butternut squash, celery, yellow-pepper, red onion, and a little celeriac. Add these to your pan, so that they surround the meat and stir around with a wooden spoon so that they’re well coated in oil. If there’s insufficient in the pan, drizzle on a little olive oil to prevent the mix from sticking. Sprinkle on some dried thyme & chopped garlic, then dot a bay-leaf or two around the meat for background depth. Return the pan to the oven and continue to roast for one hour, or until the gammon is golden brown and succulent. Once the meat is cooked, remove the gammon to your serving-dish and cover with tinfoil to rest and keep warm. Both the pork and vegetables with have surrendered a lot of liquid, so the dish is braised rather than roast. This is all to the good, as it means we have a ready-made sauce! Taste this to adjust for seasoning, then stir in a generous tablespoon of creme-fraiche and swirl around. 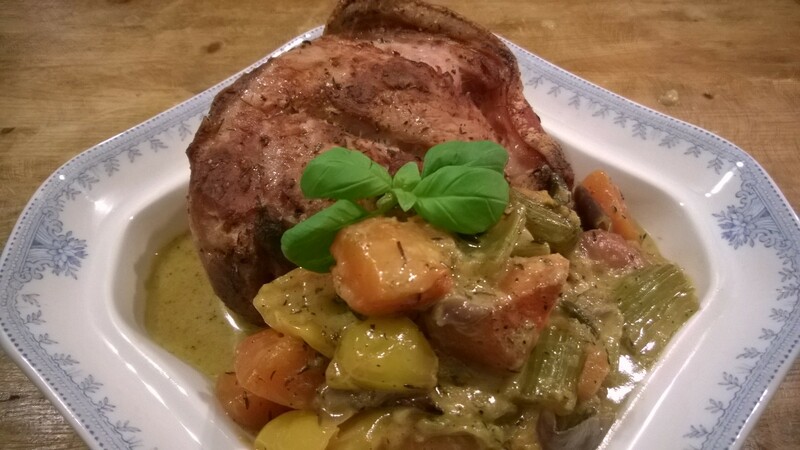 Spoon the vegetables into your serving-dish alongside the gammon, then pour on your sauce. A garnish of fresh herbs is all you need to complete the dish. It’s truly amazing how something so simple can be so packed with flavour. As I said in the title – with food this good, who needs carbs?? Not me, that’s for sure! Few dishes can abound in flavour as much as this one! Hot smoky paprika, fiery mustard & peppery rocket-leaves; all tempered by the rich warmth of chicken-stock and the creamy smoothness of butter. I love the food of Eastern Europe. There’s a fresh vibrancy to it, that’s like no other. But behind the often confrontational flavours lies a timeless polish; a food-culture that’s cherished and valued, passed down with diligence from generation to generation like the most precious of treasures. This is not the food of urban restaurants and cookbooks; rather the cuisine born of warm kitchens, family-mealtimes and love. It’s good, plain, honest fare which nurtures & satisfies; and for this reason, I applaud it wholeheartedly! Silesia is a region that has seen its fair share of history! Once part of Bohemia, it has since passed through Austrian hands, been part of Germany, Poland and Czechoslovakia. Its food speaks of all these places; possessing a rich diversity all of its own. Begin with your mustard-sauce. Finely slice a couple of shallots, or half an onion; and sauté these in butter until soft, tender & translucent. Cover to half an inch in depth with boiling water and stir in half a chicken stock-cube. Season well and add a generous rounded teaspoonful of Dijon mustard. Simmer lightly for 15 minutes or until the sauce has reduced by half, and is thick and glossy. Finish it to perfection with a good whack of finely chopped basil. Meanwhile slice your Polish sausages into half-inch chunks. The sausage can be sokolow, kielbasa or anything you can get your hands on. As long as it contains paprika and garlic you should be fine! Sauté these in a thick-bottomed pan for three to five minutes, stirring occasionally. Once they’re browned and golden, you’re ready. 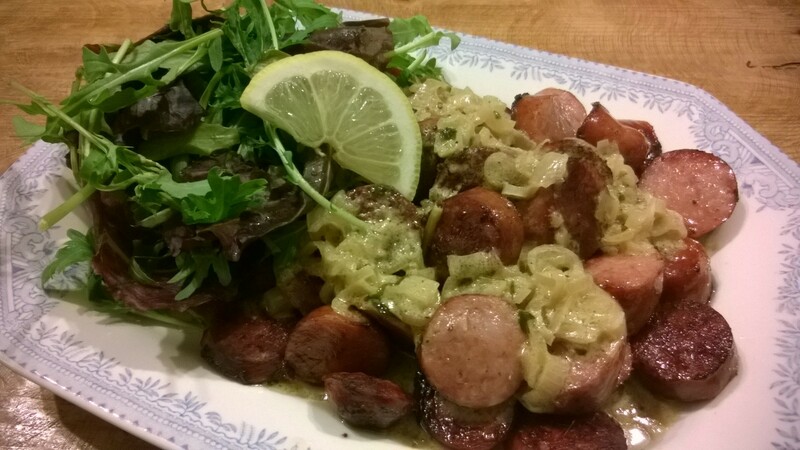 Tumble your sausages into a pre-warmed serving dish and pour your mustard-sauce all over. Serve with handfuls of peppery rocket-salad or watercress; no dressing, just beautifully natural! I prepared this as a starter; but it would equally do you proud as a main course, served with steamed vegetables in place of salad. All that’s left is to dig in! Delicious! 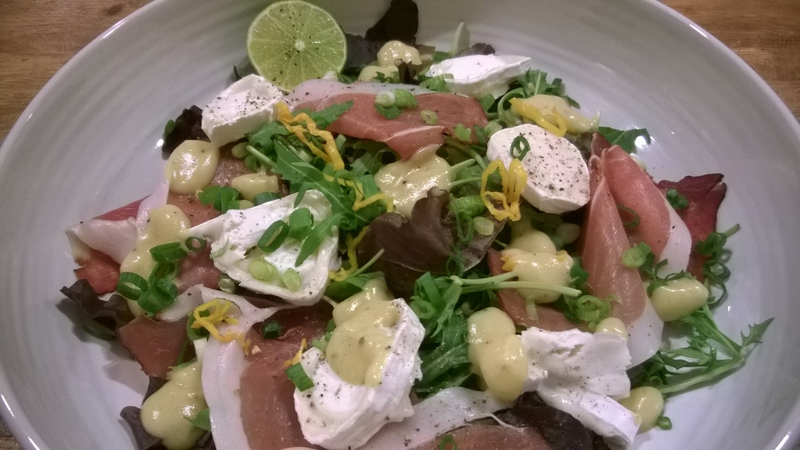 Goat’s Cheese, Parma Ham & Rocket Salad – low carb fast food that’s bursting with flavour! Good food needn’t be complicated or fiddly. Take this salad for example; it’s absolutely delicious and prepared in minutes! The slightly soured taste of goat’s cheese perfectly balances the deep, full flavour of smoky parma ham. Both ingredients are lifted by the bright ‘tang’ of vinaigrette, which cuts through the richness and refreshes the palette. I’ve also added some finely sliced scotch-bonnet chilli to give the whole thing a polite background kick! This is naturally up to you entirely. The dish is equally delicious without it! Place your rocket and mixed leaves into the base of your salad-bowl. Layer on slices or parma ham and rondelles of goat’s cheese. Finely chop a spring onion and scatter this over, followed by micro-thin slices of chilli, if you chose to use it. Spoon your vinaigrette at intervals over the salad, then finish the dish with a good squeeze of lime and lavish grind of pepper. Hey presto! A healthy, delicious low-carb salad in minutes! Good food doesn’t get any easier than this! 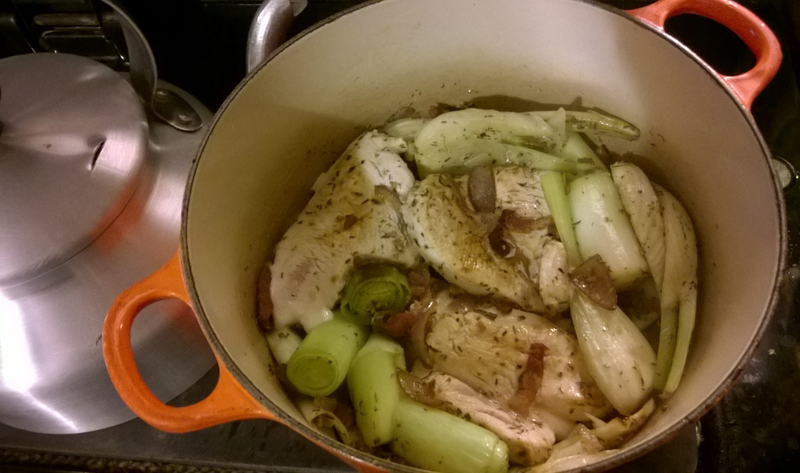 Wintry Drover’s Turkey with Smoked Back-Bacon, Leeks & Fennel – a Low Carb Winter’s Tale! Throughout the 16th, 17th & 18th centuries, December saw the roads into London transformed into a winter wonderland of feathers, fowl and frenzy! The Great Drove was afoot! Hungry urban mouths had to be fed, and this meant the mass import of livestock and produce into the capital from the surrounding countryside. All in preparation for the resplendently festive Christmas table! These thoroughfares were known as ‘drove-roads’ and it was the drover’s job to slowly herd his gaggle of squawking geese and turkeys into the big city, where his lovingly tended flock would command a far higher price amongst the capital’s rapidly aspiring middle-classes. The soul leaps for joy at the very thought! An army of slowly shuffling webbed-feet as far as the eye can see! What a cacophony of sound must have met the ear. Honking and quacking, chattering and squawking! All tended by an anxious drovesman, desperate to ensure his livelihood was delivered safe and sound in one piece! These drove-roads extended some hundreds of miles. Such a pilgrimage must truly have been a wonder to behold! And what of the drovers? The journey was long and cold. Their solace was the conveniently dispersed network of country inns and coaching-houses, all of which offered a tempting draft of ale and good plain, simple English fare. This was meant to fill, nourish and sustain the weary traveller through whatever hardships the road might throw his way. In return for a share of groaning tables laden with rustic cheeses, meat-pies, roasted meats and freshly-baked bread; the drover would occasionally sacrifice a straggler or two from his flock in payment. These offerings would’ve been prepared in the simplest of ways; drawing their rich flavour from the time-honoured staples of the English country larder. The mouth waters at the thought of rich, salty smoked bacon, freshly churned butter, sweet winter-store onions and hardy garden herbs. This dish pays tribute to the drovers of old. Although their toil is long past, it is not forgotten! At this time of year, I smile to think of the trials they must have faced, and the stories they told around the warm fires of crowded coaching inns. Whilst loyal to their memory, I cannot entirely echo their diet! This is a low-carb blog; so the bread and pastry which sustained them through the cold winter nights will not be bolstering my own fat reserves! My energy needs are not a fraction of theirs; nor is my constitution! But when food is as rich and wholesome as this, who needs carbohydrate? Not we! This recipe requires a good, sturdy cast-iron pan. Place this on the hob with a generous knob of butter. Dice your smoked bacon into small chunks and pan-fry until golden and brown. Add to this coarsely chopped onion, leeks and garlic, then add your turkey to the pan. Seal this on a high heat, before stirring in sliced fennel and a good whack of chopped fresh herbs. Warmly fragrant sage and thyme would be my choice, but this can naturally be varied to your preference. Pour on boiling water until the liquid just laps ‘chin-height’ of the pan’s contents. Please note – no wine or alcohol is needed to deglaze this dish. The flavour is delivered solely by the plain, honest and wholesome ingredients we see before us; tangy fennel, smoked bacon and savoury herbs. We need nothing more. Place the lid firmly on the pan and oven-roast for up to one hour, until the liquid is all but reduced and the turkey is soft and tender. I serve this with baked garlic field-mushrooms, cooked for 20 minutes in a hot oven with a generous spoon of garlic butter on top and lots of freshly milled black-pepper. So at table in the warm; spare a thought or two to the drover on his long, hard journey. And maybe raise a glass to his memory. His food legacy will certainly not disappoint, so lets all drink to that! Winter is well on the way, and I love it! 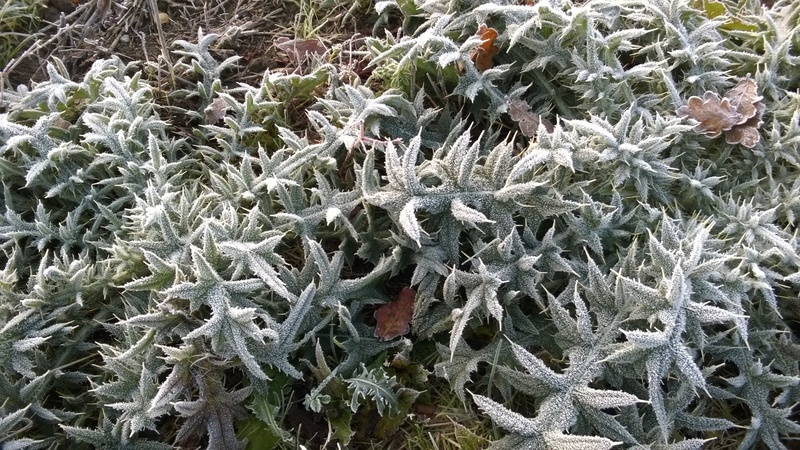 This morning, my boots went crunch, crunch, crunch in the thick frost. 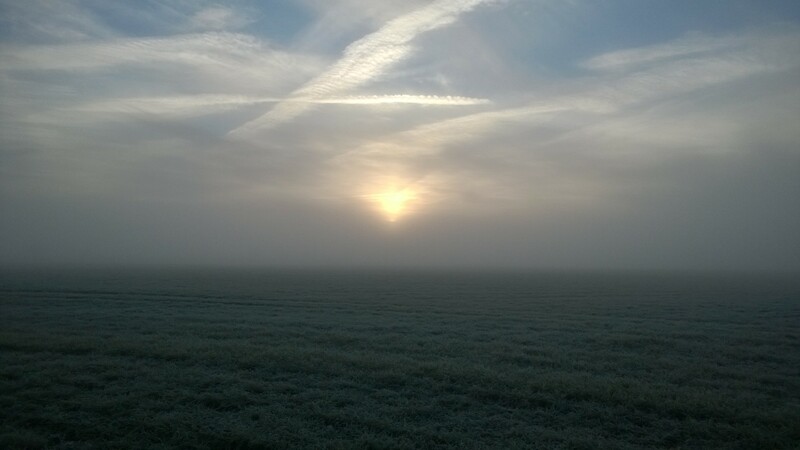 Toasty-warm in my woolly jumper, scarf & mittens; I bounced round the field with steaming breath, just like a child! 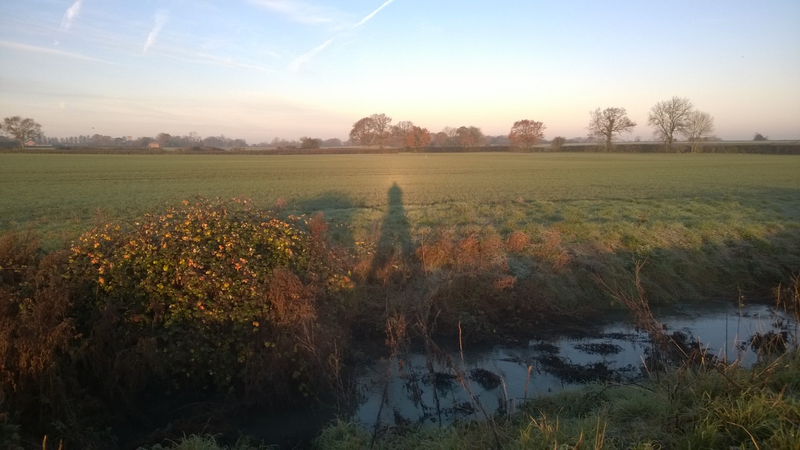 As the weak sun slowly managed to melt the ice; the water-droplets seemed to glint and sparkle around my shadow, creating a magical halo of frost. It was enchanting. 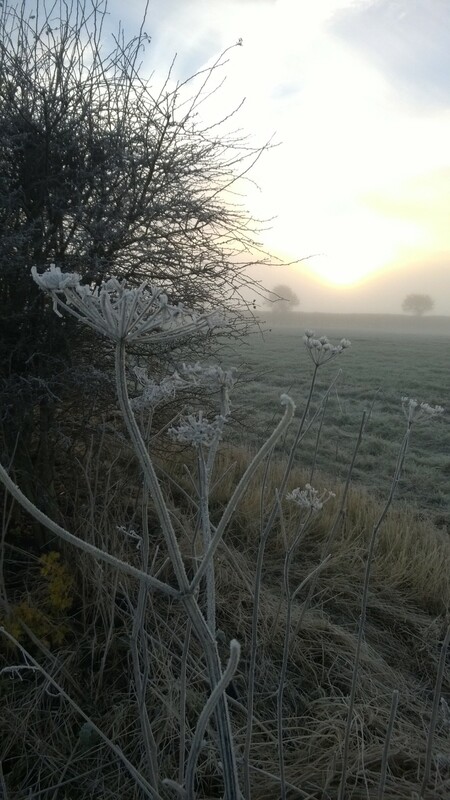 But just see how beautiful everything looks in the frost. If only the camera could pick up all the wonderful things I’d love to show you. 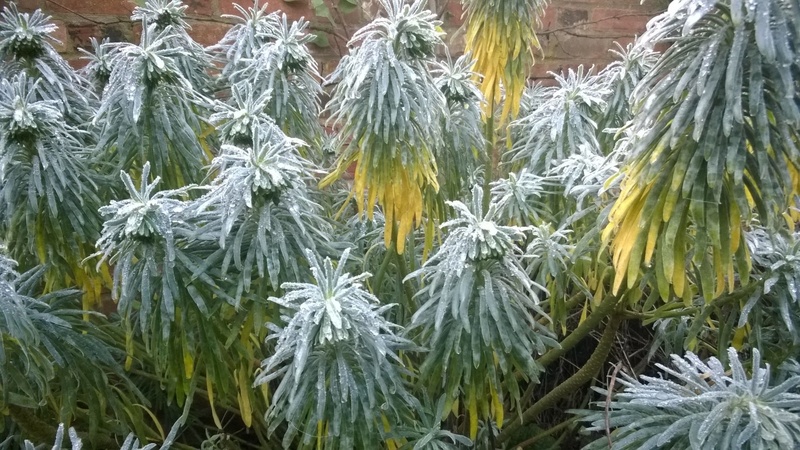 Whatever you get up to on this frosty morning; wrap up nice and warm and enjoy the day! 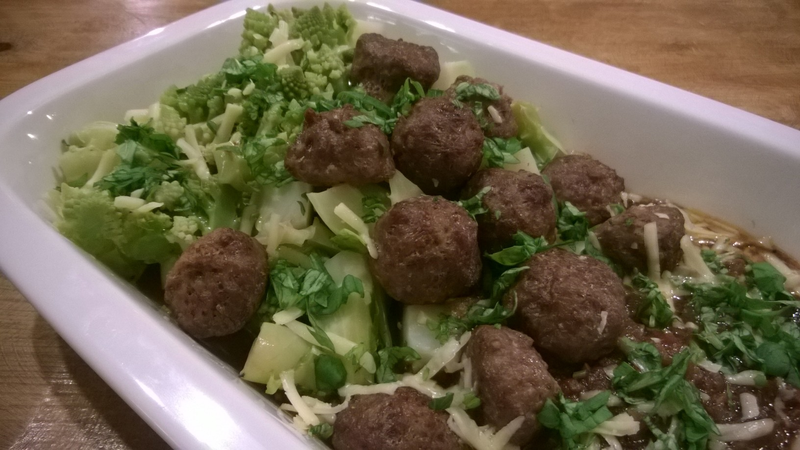 Spicy Chilli-Beef Meatballs with Tomato Ragout, Steamed Romanesco & Manchego – low carb, fast & delicious! Back home late from work? Well this dish is low-carb in a hurry! Having said that, there’s no compromise on flavour, and you still get that wonderful home-cooked taste and feel! So if it’s nurture you’re after; what could be more delicious than meatballs in a rich tomato sauce covered with cheese?? Few things, I’ll wager! As is the case with all the recipes on this site, there’s no gluten involved, so those with allergies or gluten-intolerance can tuck in without issue. Because the levels of carbohydrate are incredibly low, type 1&2 diabetics need have no fears over blood-sugar spikes or insulin-matching. This is LCHF to the core, so ketogenic-dieters and paleo-fans are all welcome at the table! There’s plenty to go around! When I say ‘spicy chilli-beef meatballs’, the chilli is predominantly included in the sauce. If you have more time however, you can add this to the meatball mix itself. I was up against the clock to get a meal on the table, so I took the short-cut. I leave it up to you which route you follow. Start by making your sauce. Finely slice leek, shallots or onion and sauté these in olive-oil and butter until tender and translucent. Add 2 crushed cloves of garlic and a sprinkle of dried chilli-flakes (to taste). Cook for a minute, then pour on a centimetre’s depth of port, enjoying the ‘sigh’ as it hits the pan. Wine is not great on a ketogenic-diet due to its relatively high sugar content. To avoid opening a bottle just for cooking, I keep two bottles in the cupboard – one of dry vermouth, to take the place of white wine; and another of port to serve as red. Neither of these suffer from being consumed over a long period of time, plus it makes things considerably cheaper in the long run. Strain the liquid from half a can of tomatoes and add these to the pan, plus a little water to be getting on with. Why not simply use the tomato juice? Carbs. Crumble in a beef stock-cube and a teaspoon full of mixed, dried herbs. Simmer for 20 minutes until thick and glossy. Meanwhile make your meatballs. 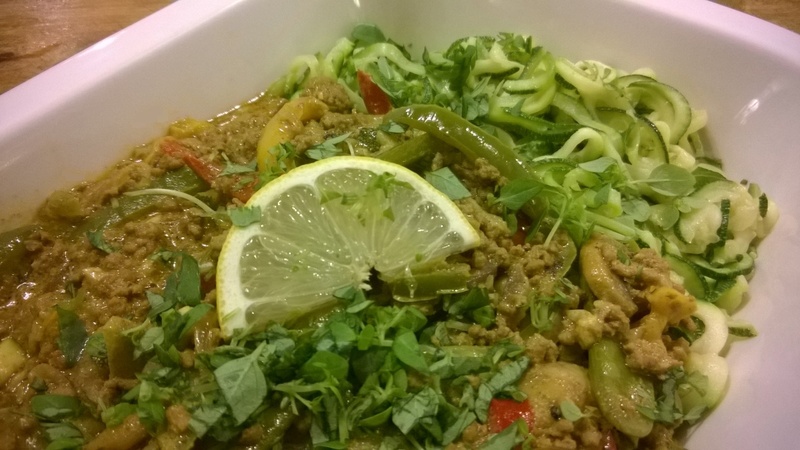 Season your minced beef with a generous hand and sprinkle in half a teaspoon of hot-chilli-powder. You can use fresh chillies if you wish, but I was trying to cut down on labour so opted for the powder. You can also buy excelled ‘pre-formed’ fresh-meatballs from most supermarkets. If that is your chosen option, simply dust these with a light-coating of chilli-powder and cook in the same way. Place your meatballs onto a baking-sheet and oven bake for 15 minutes until succulently brown and delicious! While these are in the oven, detach the romanesco-florets from the stalk one by one, so that you preserve their fine structure. Bring a pan of water to the boil then add the florets respectfully into the water. After two minutes on the boil, drain and plunge into cold water to preserve the verdant green and texture. Once cool, tumble back into the pan and place into the oven for a final 5 minutes to heat through. You can simply serve this straight from the boil, but it always seems a shame if it loses its bright vibrancy. If you too are under time-constraints, I certainly wouldn’t judge you for taking the shortcut. When all is ready, take the meatballs and romanesco from the oven and tumble these into your pre-warmed serving-dish. Pour your sauce liberally over the top and sprinkle with a shocking amount of grated cheese. I used manchego on account of its taste and texture; but parmesan or cheddar would equally put on a splendid show! Garnish with a final flurry of chopped herbs et voila! Dinner is served. 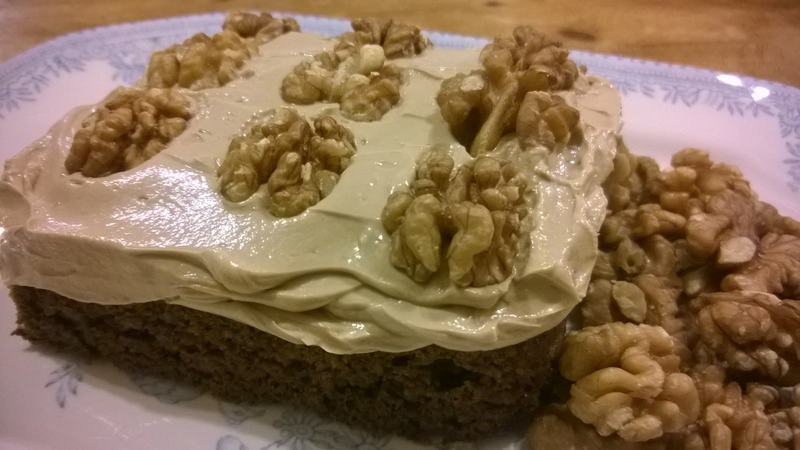 Dark & Delicious Coffee & Walnut Cake – a low carb, LCHF diabetic treat! There’s a refined ‘grown-up’ pleasure to coffee and walnut cake. The taste is pleasingly sweet, but also carries an intensity not found in other flavours. Because the cake is incredibly low in carbohydrate, it’s perfect for diabetics, paleo-fans, gluten-intolerants and those on a ketogenic-diet. It’s truly astounding that you can still eat this kind of food and lose weight. Sometimes it’s best not to question things I say. Just enjoy them! The type-1 diabetic in my life certainly lives by that mantra. It’s so nice for diabetics to have delicious food without having to worry about the implications. This recipe won’t affect your blood-sugar, so can be consumed with largesse! There’s no fiddly insulin-adjustment required, as there’s virtually no carbohydrate. All you get is enjoyment! So give it a go! To make the cake, weigh up 6oz of ground-almonds and 4oz of dessicated coconut. Add to a sturdy mixing-bowl and stir in 1 teaspoon of bicarbonate of soda, plus the same of flaxseed. Measure 3oz of xylitol sweetener and combine this with the almond-mixture. I always use xylitol in baking. In my experience, it’s the only sweetener which retains its sweetness once cooked; and its granular texture means that it behaves exactly like sugar in cake-recipes. Set 2 large tablespoons of coconut-oil to melt by the range; or microwave it until liquid. Then whisk in a large tablespoon of instant coffee & add the coconut-mix to your bowl. Finally, stir in 3 beaten eggs and a handful of chopped walnuts, and fold until you have an easy-to-please dropping-consistency. Spoon the cake-mix into your cake-tin. I used a large rectangle tin; but you can also use a round or square tin to your preference. Bake in a moderate oven for circa 30-40 minutes, until risen and browned. The cake should be spongy and resistant to the touch, and rise back up when pressed lightly with the finger. Remove from the oven and cool until room-temperature. Once the cake is thoroughly cooled (and yes; it needs to be, or your icing will melt everywhere); dissolve a large teaspoonful of instant coffee in a tablespoon or two of water and leave to cool. The cold weather being what it is, I tend to cover things with a tea-towel and place them out on the garden wall for 5 minutes. That always chills things down far more quickly than even the most high-tech refrigerator! Place 4 large tablespoons of cream-cheese into a bowl (full fat please). Add your cooled coffee-mix & half a cupful of table-sweetener (this can be other than xylitol, because it’s uncooked). You’ll also need to pour in two tablespoons of whipping-cream. This is required to thicken the mix after the addition of the liquid coffee. Whisk well until you achieve a spreading-consistency, then test for sweetness, adjusting levels to your preference. Layer the frosting generously atop the cake with a palette-knife. Position walnut-halves at intervals across the surface and a pile to the side. And with that, pudding is served! Another great thing about this recipe is that it works brilliantly as a morning-coffee or afternoon-tea accompaniment. What I’ve always liked about these ‘mini-meals’ is that it gives one licence to have slices of cake throughout the day! But because it’s low in carbs; there’s nothing stopping you. Dig in! 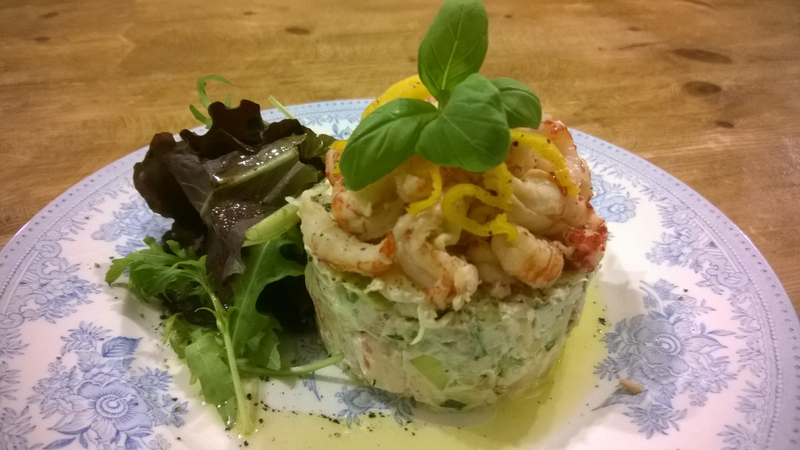 Timbale of Leek, Parmesan & Crayfish-Tails with Dressed Green-Leaves – true low carb sophistication! I always feel that if you enjoy food & spend time preparing it, the presentation should certainly not let you down. But what often looks complicated, in actual fact can be incredibly simple. This low-carb dish is a perfect example! In comparison to prawns or crevettes; crayfish-tails are far less sweet in flavour. As a result, butter-softened leeks make their perfect bedfellow. This recipe also uses cream-cheese, which is incredibly mild in flavour. The salty intensity of parmesan serves to ‘lift’ this, and provides background depth to the whole dish. This combination is one which therefore works on all levels. Give it a go and tell me what you think! Start by slicing your leek as finely as you can. Sauté the slices in salted butter on a low heat. Once the leek has softened, but not coloured; spoon it onto a wide dinner plate, spreading the mix as thinly as you can. This is so it cools nice & quickly. The cold weather being what it is, I tend to cover the plate with a tea-towel and place it out on the garden wall for 5 minutes. That always chills things down far more quickly than even the most high-tech refrigerator! Once your leeks are nice and cool, scoop into a mixing-bowl and add a large tablespoon of full-fat cream-cheese (no reduced-fat please – we’re on a ketogenic diet after all!). Finely chop some basil and add this to the bowl, plus a good squeeze of lemon-juice. Pile your crayfish-tails onto some kitchen-paper and squeeze lightly to drain any excess liquid. Place half of these into the mixing-bowl and season well. Add a half-handful of grated parmesan, then fold the mix together with an authoritative hand. Be careful not to beat the lot into a paste! That would prove unsightly and ruin your efforts. Test for seasoning then press into your oiled timbale-moulds, or ramekins as above. Upturn the moulds into the centre of your serving-plate, then take the remaining half of your crayfish tails and pile them up on top to form your dome. If you’ve done this properly and used the real timbale moulds, don’t worry; just carry on piling up the crayfish-tails regardless! Garnish the top with thin slices yellow scotch-bonnet chillies and a basil leaf. Dress your salad-leaves with vinaigrette and place a small handful onto your plate. Top this with a few shavings of parmesan and finish the dish with a final drizzle of vinaigrette. Truly delectable in every way! 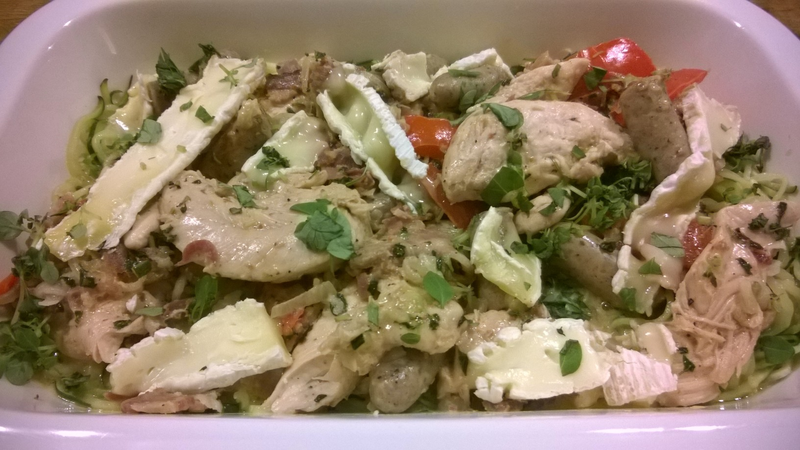 Black Forest Chicken with Courgette-Noodles – speedy, low carb comfort food! We’ve had an incredibly busy day, so I really wanted something quick & easy, but which didn’t have that feeling of a ‘rushed short-cut meal’. Black Forest Chicken it is! The reason I call this dish ‘Black Forest’ is that it contains both the wonderful smoked ham and sausages of that region (the same area as the world-famous Black Forest Gateau). Any smoked ham or fast-cook sausages will serve in their place, but the rich smokiness of the original is the perfect thing for a chill November’s night. We had the fire alight in the sitting-room, and the smell of the wood-smoke seemed to mingle seamlessly with the rich, cured pine-flavour of the ham. This is partnered wonderfully by the smooth creaminess of brie, which diffuses the ham’s taste on the palette, plus goes that almost ‘sticky meltedness‘, which is truly irresistible! The combination of this, plus bacon, sausages and chicken make this the ultimate in comfort food. Give it a go yourself; you’ll soon see what I mean! Dice your bacon and sauté in butter in a thick-bottomed pan alongside your chopped sausages. Once these start to brown, add sliced chicken fillets and finely chopped shallots (or onion). Roughly dice a red-pepper and add this, then crush in two cloves or garlic and cook on a medium-heat for a couple of minutes until the chicken is coloured all over. At this point, deglaze the pan with a good glug of dry vermouth and season well. Add water to a centimetre’s depth and crumble in a chicken stock-cube. Simmer on the hob until the liquid has reduced by two thirds of its volume. Meanwhile prepare your zoodles, then melt a good tablespoon of butter in a wok. Stir-fry the courgette-noodles until cooked through, but still retaining their bite. Place the cooked noodles in the oven for 2 minutes, to stave off any moisture which may have collected in the bottom of the pan. Whilst the noodles are finishing in the oven, add a large tablespoon of creme fraiche to the sauce and stir through until smooth. Finely chop some basil and sprinkle this into the sauce, stirring the whole time so that the cream doesn’t catch on the bottom of the pan. Take the courgette-noodles out of the oven and pour over the sauce. Make sure the chicken and sausages are distributed evenly in the dish, so that no-one misses out! Dot the surface with thick slices of brie and garnish with a final flurry of chopped basil. 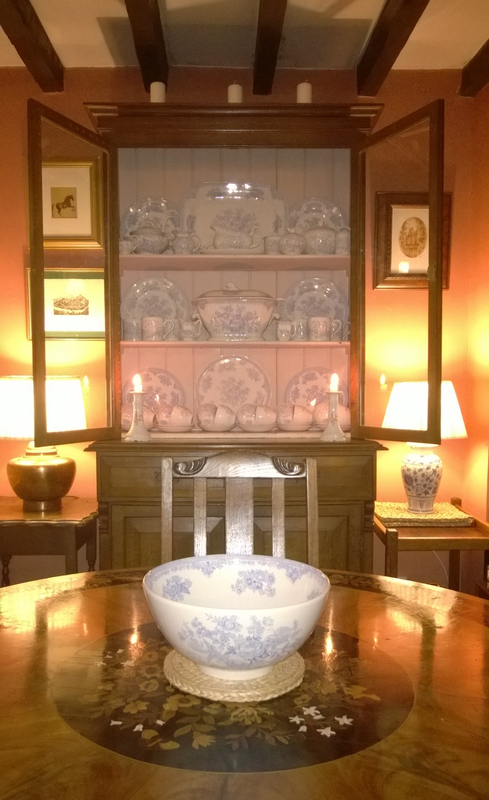 Serve in large, shallow pasta-bowls and eat in as relaxed a setup as possible. I wholeheartedly recommend curling up on the sofa in front of the fire, if you can. This is the perfect dish to do it with! 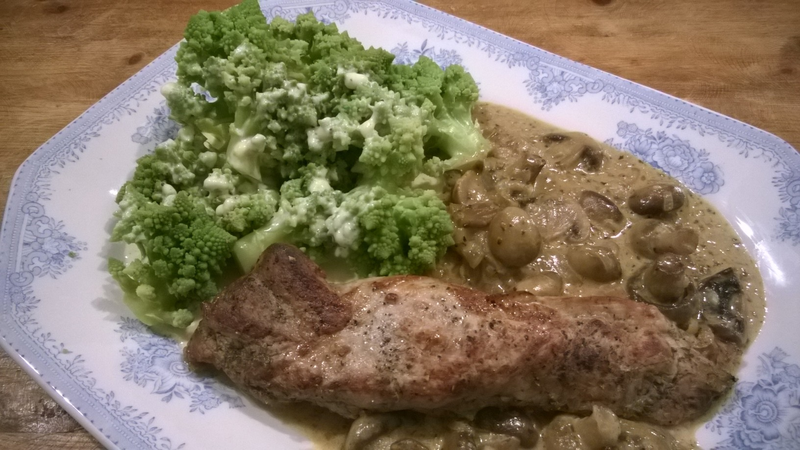 Pan-Roasted Loin of Pork with Creme Fraiche, Shallots & Chestnut Mushrooms, Served with Rich Romanesco Mornay – quite literally, a low carb feast! Loin of pork is a wonderful thing to cook. It’s always incredibly tender, yet refreshingly simple to prepare. Here I’ve chosen a classic French approach, of white wine, mushrooms and creme fraiche. This combination delivers flawless results every time, and has that real wow-factor, which makes this the perfect thing to cook for a dinner party. No such grandeur for us however! I’ve chosen this for a cosy meal for two on a cold Autumn night. This means we have the added bonus of being able to enjoy the leftover pork for lunch another day. It’ll carve beautifully into thick, succulent slices; to be served with salad, peppery radishes and fiery hot mustard. I’m all for meals which have ‘ongoing promise’ – you just have to make sure you’re disciplined enough not to eat the lot! Romanesco is a true jewel. Sometimes the beauty of nature is breathtaking in every way. The almost crystalline turrets formed by this member of the cauliflower family, bare its ancestor’s texture but have more the delicate taste of broccoli. 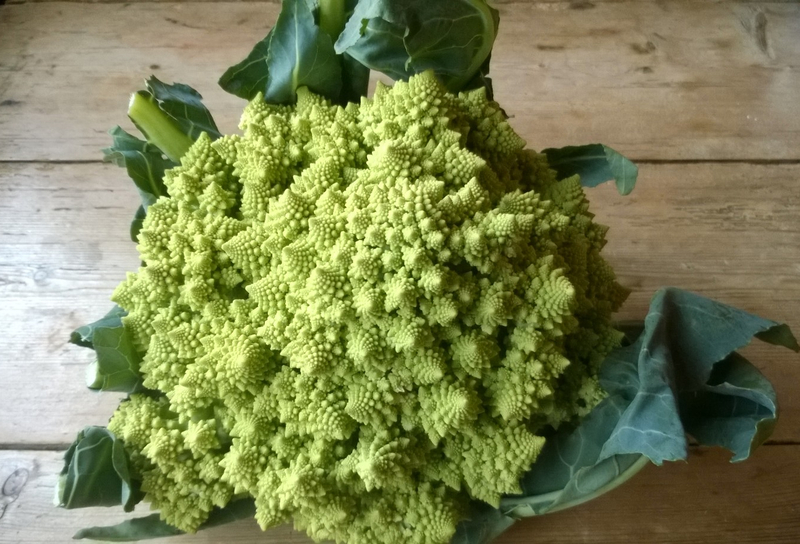 Romanesco is packed with nutrients, which has earned it the prestigious accolade of ‘superfood’, and yes; it’s low in carbs, so diabetics and keto-dieters can tuck in with vigour! Beyond all that however, it’s totally delicious and goes with anything. For people who think that vegetables tend to lose their colour or interest levels in winter, romanesco will be music to your ears. I challenge even the hottest of summers to come up with anything as beautiful and tasty as this! Place a heavy-bottomed pan on the hob and melt in a generous knob of butter, with a little oil to stop it burning. Season your pork and seal it until caramelised and golden on each side. Add a large handful of sliced shallots and two cloves of finely chopped garlic. Roughly slice your mushrooms and sauté alongside the shallots, or keep them whole if you’re lucky enough to find mushrooms small enough. Once these are soft and tender, deglaze the pan with a generous glug of white-wine or vermouth. I want to share a tip here. Wine is not great on a ketogenic-diet due to its relatively high sugar content. If you wish to use it in cooking, then invariably you’ll be stuck with the rest of the bottle which you must either drink (bye bye diet) or throw away (tragedy). To avoid this, I keep two bottles in the cupboard – one of dry vermouth, to take the place of white wine; and another of port to serve as red. Neither of these suffer from being opened and consumed over a long period of time. It also makes it considerably cheaper in the long run, as their taste is robust enough to warrant a smaller quantity in cooking. Once the alcohol has reduced, pour in a little water, so that the pork is waist-high in liquid, then crumble in a chicken stock cube. Season well and stir in a handful of chopped herbs. Tarragon, sage, basil or oregano are all good. I used sage on account of its warm and perfumed flavour. Place the pan (lid off) into a hot oven, to braise for 20 minutes, whilst you get on preparing the romanesco. It is almost heartbreaking to cut into this vegetable’s cryptonite crowns. It’s so pretty that it almost seems a shame to eat it! But do so we must. Detach the florets from the stalk one by one, so that you preserve their fine structure. Bring a pan of water to the boil then add the romanesco-florets respectfully into the water. Second tip of the day. As any Victorian cook would tell you: if it grows above the ground, boil with the lid on! If it comes from below the ground, lid off! This handy mantra will see you safely through any recipe and mean your vegetables cook to deliver their optimum. After two minutes on the boil, drain and plunge into cold water to preserve the verdant green and texture. Once cool, tumble back into the pan and place into the oven for a final 5 minutes to heat through. You can simply serve this straight from the boil, but it always seems a shame if it loses its bright vibrancy. To make your low carb mornay sauce, heat a cupful of double cream in a saucepan and stir in a handful of grated cheese. I used cheddar and a snide amount of parmesan. It must be admitted that any cheese which delivers a noble taste-profile will serve just as well. Grind in some pepper, and leave on the simmering plate until smooth and glossy. Take your pork out of the oven and place the loin onto your pre-warmed serving-dish. Return the pan to the hob and stir in a tablespoonful of creme fraiche for richness. Once this is incorporated and the sauce is piping hot, pour over all and around your pork, assembling the mushrooms into an accessible pile to one side. Spoon your romanesco next to the pork-loin and pour over your mornay sauce. 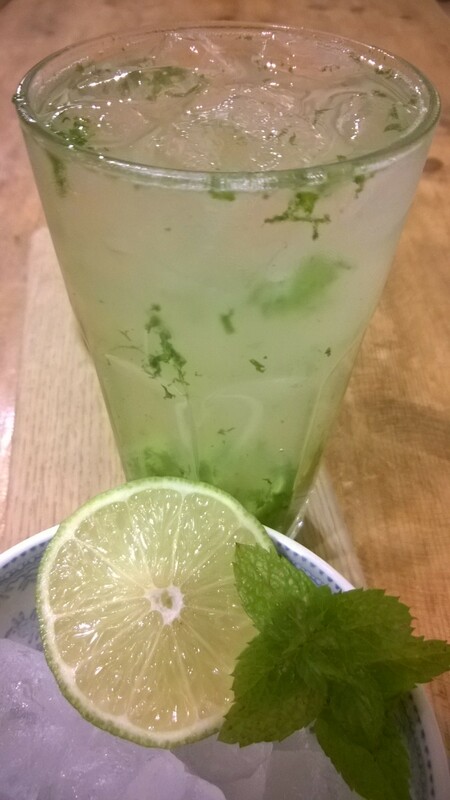 Garnish with more chopped herbs and volia! Dinner is served. A true treat that’s as low in carbs as it is delicious. And all done in 40 minutes!